(March 17, 2019) I can’t guarantee that you’ll become a backyard farmer just by listening to this show episode. But I can guarantee that the guy who calls himself The Backyard Farmer will point you in the right direction. His name is Dan Gibbs and his own path to becoming a farmer was not a straight one. Dan is a River Forest [Illinois] native, but in 2000 he moved to Southeastern Wisconsin, where he purchased an eight-acre farm. Dan didn’t have a background in farming. He moved to Wisconsin because he is a commercial pilot and an airport there wanted a chief flight instructor. His move into farming started at the Springdale Farm, a community supported agriculture (CSA) farm in Plymouth, Wisconsin. After one season there, he worked with a farmer to till five acres on his own farm, and his CSA was born! For four years, Dan sold produce from his farm to restaurants and grocery stores in Wisconsin and here in River Forest and Elmhurst and also delivered to 100 households. In 2014, he gave up his Wisconsin business but started another one in Illinois, called The Backyard Farmer. Its mission is “to make local food gardening accessible and easy for families through education, inspiration and ongoing support. ” He accomplishes that by helping his clients through all phases of growing–planning, design and installation. He also works with the Austin Green Team, where he is president and garden leader. That organization converts derelict properties into gardens. And he is a garden educator for an organization called Big Green. Their goal is to create a replicable, scalable school garden solution. Peggy and I talked to representatives of Big Green when they were still known as The Kitchen Community. They have already built 180 school gardens in Chicago since 2012, with a goal of getting to 200. One of their campaigns is Plant a Seed Day, which happens on March 20. It’s a national campaign to get students, teachers, and families to take a simple action – plant a seed. Works for me. You, your school or your company can sign a pledge here. Deep Roots Project recently posted a series of videos of Dan’s “Crop Planning in the Midwest” lecture. We’re going to tap into some of that knowledge on today’s show. All you need to know about the Good Food EXPO is that it is America’s longest-running sustainable and local food trade show. Actually, there’s a lot more to know. For instance, it’s presented by familyfarmed, which has been working for more than two decades to build a better, healthier food system. And the EXPO connects industry farm and food produces with trade buyers, wholesalers, retailers, investors and introduces them to consumers. Andrew Margenot shows off his soil testing phaser at the 2018 Good Food EXPO. Okay, that’s not what it’s really called. The EXPO also features cooking demos by renowned chefs, and seminars and workshops by experts from all over the Good Food spectrum. Friday is the Good Food Trade Show, which is what I would describe as the business side of Good Food ( 8:30 am – 5 pm; Networking Reception: 5-7 pm). You need to purchase tickets for that day, but they include the Networking Reception and Chef of the Year ceremony honoring Jason Hammel of Lula Cafe. and bringing more farm-to-table sourcing to restaurants. There are also Good Food is Good Medicine panels about the powerful connections between food and health. And what would the Good Food EXPO be without the incredible number and variety of vendors that cover the entire spectrum of Good Food. Of course, our coverage of this terrific event wouldn’t be complete without an interview with its founder. Jim Slama hasn’t been on The Mike Nowak Show every year of the Good Food EXPO, but he’s been here for many of them. He started FamilyFarmed and he started the Good Food EXPO, though it has gone by several different names over the years. Today he joins us in the 1590 WCGO studios to help help us celebrate an important milestone in Chicago Good Food. Finally, here’s another reason to show up at the Good Food EXPO. From 11am – 4pm, soil scientists will provide FREE lead screening for soil samples from your urban garden, farm, or yard. It’s part of the Chicago Safe Soils Initiative. 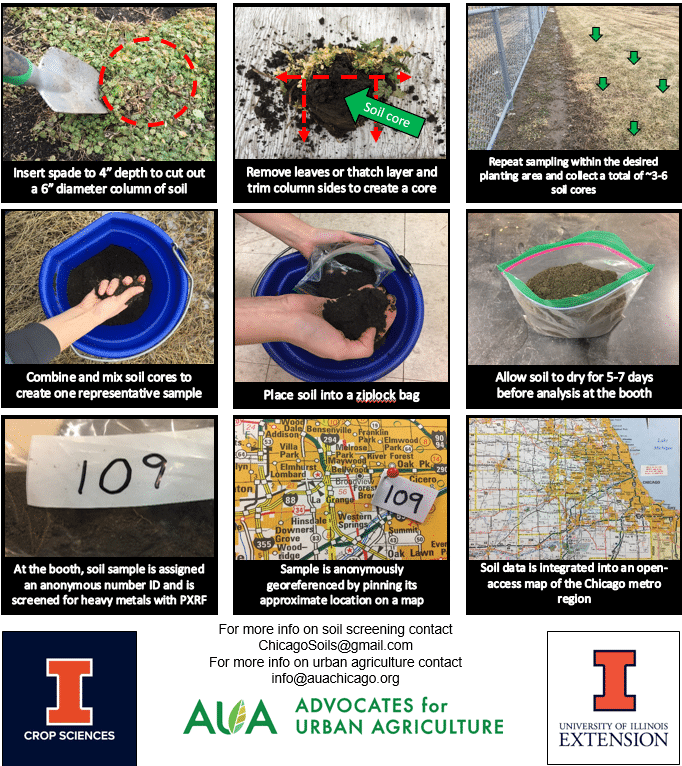 This is a collaborative initiative among the University of Illinois Urbana-Champaign, the University of Illinois Extension, and Advocates for Urban Agriculture (AUA). Meanwhile,Click on this link for a photo chart on how to prepare your sample. Then bring it to the Good Food EXPO or the Chicago Community Gardeners Association (CCGA) Conference on March 30.